A House and Yard: Wake Up, Sleepyhead! I knew it would come up sooner or later. Guess today's the day. I was minding my own business, catching up on other blogs and BOOM. There it was. Becoming More Productive by Reengineering Your Morning Ritual by Michael Hyatt. Listen to it. It's good. My morning ritual. Oh, I have a ritual, all right. It's easy and cozy. It's mine. Wake up when I do. Start the water for my coffee press. Feed the cats. Start the computer. Drink my coffee in front of the computer. Start school with Silas after he gets up and has breakfast. My morning ritual is extremely relaxed and just plain lazy. Consequently, it sets the tone for the rest of my day. Gone are the days when the kiddos wake me at the crack of dawn to make them breakfast. Everyone who lives in the house right now is self-sufficient. I am privileged to enjoy freedom in my schedule I have longed for and only dreamed of 10 - 20 years ago. The blog title grabbed my attention. "Becoming More Productive...." I want - need - a higher level of productivity and know my morning routine is feeding the opposite. Listening intently to Mr. Hyatt's podcast, his instruction and example resonated with my desire to bring more order to my life. Let the reengineering of my morning ritual begin. This is going to be fun! What does your morning routine look like? Are you happy with it or is there room for improvement? Quick project updates....the kitchen corner clutter is being tamed and the cat re-training has begun. So far, so good. I love your blog! 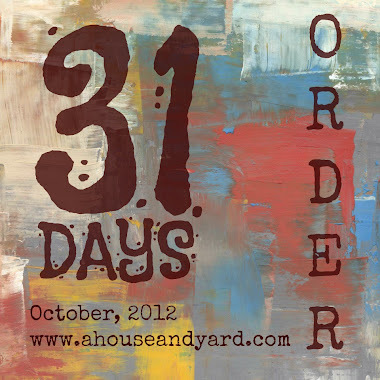 Especially your 31 days of Order series. Hmmmm have had your link on FB for ages, but don't often get over to read....that evil genius procrastination is one of my nemesis as well. Nemesis, nemeses, nemesii?? Ha! Anyway, wonderful thing you are writing! Thanks so much for being so open and transparent with your life. God Bless! Ahhh....the morning "thing." I HAVE to get up and out to work by 7:30 - but I've struggled a LONG time to get up and have my quiet time BEFORE school. It is SO hard to get out of bed to do that or get on the treadmill. WHY!!!??? LEt me know what you do. AND - where are the updates on the kitchen project?